The purpose of this script is to make it easier to read large numbers, for instance, to format 3295002640005 as 3GB. It's difficult to get a 'feel' for large numbers, this is particularly true if the raw value is in bytes – a common scenario when measuring disk or file sizes. Even after adding a thousand separator it's still difficult to estimate if 230993200055 is approximately 200 Gigabytes, or 2 Terabytes. If you relied on guestimation when buying a disk you could make an expensive mistake! This script identifies the range of the input by employing the standard PowerShell 'If' and 'ElseIf' constructions, for example, it starts by checking 'If' the number is greater than, or equal to, 1 terabyte:- If ($Type -ge 1TB). $BigNumber = Read-Host "Enter disk size"
'Function' – Declares the script block that follows. 'Param' – The key feature of this Format-DiskSize function. Note 2: I declared the $Type parameter type as [long]. You could also try [decimal]. However, I found that [int] could not cope with values in the gigabyte range, that is why I recommend [long] or [decimal]. Here is a script that employs Get-WmiObject to retrieve information about the size of the various volumes on the machine from where you run this script. 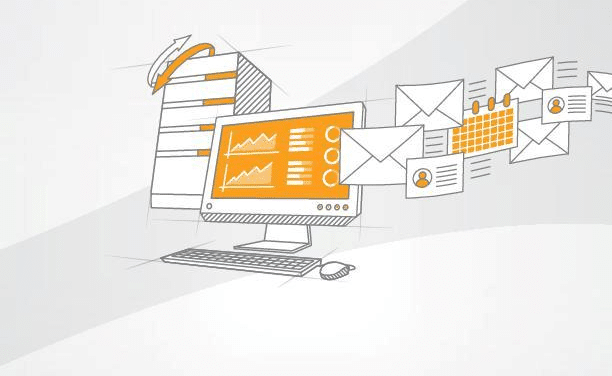 Write-Host "Calculating Volume Sizes …"
#Section to utilize newly-created function. Here is another job for a function, namely to format the numbers so they show a meaningful format, it also displays units that vary depending on the number of digits in the raw file length. # N.B. Requires PowerShell 3.0 or later. Note 5: This script focuses on the C:\; You could amend the source to C:\Windows. 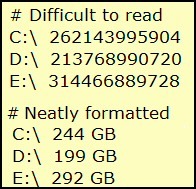 It can be difficult to read large numbers, for instance to format 3295002640005 as 3GB. Here is a classic job for a PowerShell function to display the disk size bytes as MB, GB, or even Terabytes.